Pregnant? A mommy to be? Expecting a baby soon? A new mom? Well, don't miss this chance! 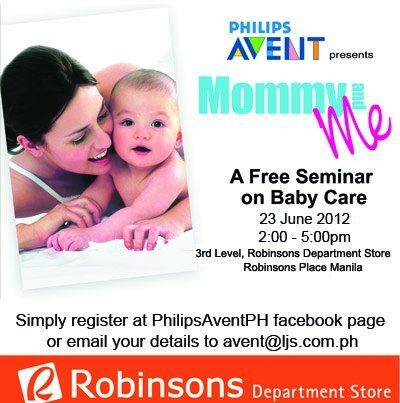 Join Philips AVENT's Mommy and Me Event on June 23. They will have a free seminar on Baby Care at 3rd Level, Robinson's Department Store, Robinson's Place Manila. Greetings from Cannon Baby Safe Products! You are invited to Mommy and Me event. Where:3rd Level, Robinsons Department Store, Robinsons Place Manila. Admission is FREE but pre-registration is a must. Please feel free to share this your friends and family that may be interested to join.